In my emails I discuss how I’m maintaining my weight loss using the 5:2 version of The New You Plan. A major part of my decision to continue to maintain my weight and to do the 5:2 version of The New You Plan was because it lets me have CONTROL! I have control of my weight and I am not going to go back to the old me! The old me was unhealthy and very unhappy. I hid behind my smile and my target everyday was to pretend I did not care that I was over weight, to not care that I never felt happy within myself, to not care that every time I looked in the mirror I could have cried! BUT… I DID care! I cared but I thought: “This is me, this is who I am and I can’t get to my desired end result… It’s too hard… It’s too far away.” Excuses after excuses. The struggle of having to try was too hard. I was in self pity and it still took years for me to actually do anything about it. 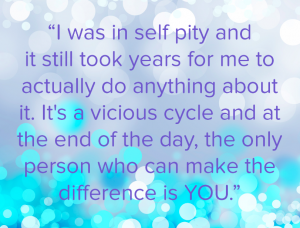 It’s a vicious cycle and at the end of the day, the only person who can make the difference is YOU. “Ahh, she is a lovely big bubbly girl!” – If I was to hear that one more time! Drop the big – I’m happy with bubbly! I wanted to hear “Ahh she’s bubbly” without that word before it. It crushed me every time I heard it. I literally decided one day that I couldn’t feel sorry for myself. That it was going to achieve NOTHING! So I took that leap and decided I’m doing it and I did. And YOU can do it too! I took control and guess what!? I am KEEPING it. 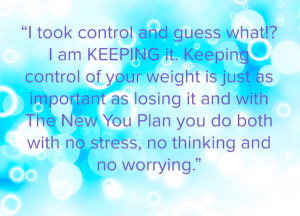 Keeping control of your weight is just as important as losing it and with the New You Plan you do both with no stress, no thinking and no worrying. I am off to sunnier times in a few weeks and I have just placed another order for New You Plan Total Food Replacement meals and snacks. I am in control as I know when I go away I will be enjoying myself and letting go for a week. But I am preparing for that week and putting the work in now so I do not go into that downward spiral that happens when you do say: “Ahh, I’m on holidays, I will enjoy myself.” That moves to “Ahh, I will start again next week” and that then turns into next weekend, then next month and before you know it the pounds creep back on. But not me! I’m on plan starting Monday for one full week to get myself ready for what I know will be a gain but hey, so what! I’m happy in the knowledge that I have prepared for this and I plan to go straight back on my 5:2 version of The New You Plan as soon as I get home. And if you plan to do the 5:2 version of The New You Plan, you will receive access to our exclusive Maintainers Facebook group. The guys on the plan have been cooking up a (healthy) storm in the kitchen this week. Check out their delicious meals below! To join our exclusive Facebook Maintainers group, simply drop us a private message here.